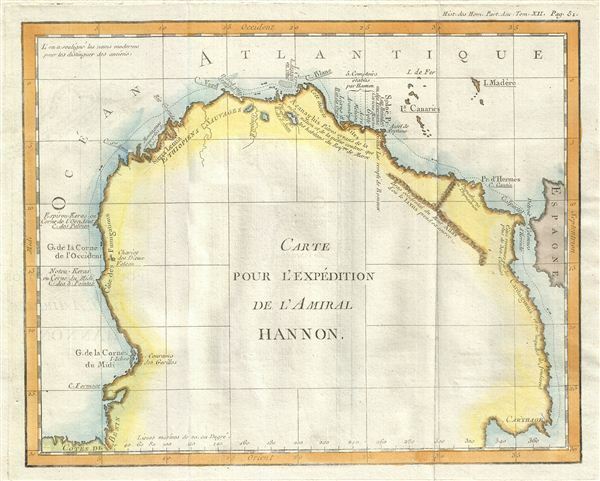 Carte pour l'Expedition de l'Amiral Hannon. This is a fascinating example Jean-Baptiste-Claude Delisle de Sales' 1770 map of western Africa. Oriented to the west, this map covers northwest Africa from the coast of Benin to the Mediterranean Sea. This map depicts the journey of the ancient Carthaginian explorer Admiral Hanno (not to be confused with Hanno the Elder). Between 500 and 480 B.C. Carthage commissioned Hanno with sixty ships and 30,000 sailor s to find (or found) trading colonies on the western coast of Africa. He recorded his expedition on a tablet entitled Periplus and on his return hung it in the temple of Ba'al Hammon (Kronos). The city of Thymiaterion, reportedly founded by Hanno, is identified along with various other locals referenced in the Periplus. This magnitude of Hanno's achievement can be best understood when compared with the struggles of the Portuguese 2000 years later to navigate the same stretch. Equipped with modern ships and advanced navigation techniques, it took Portuguese explorers nearly 100 years of only partially successful attempts to reach the Bight of Benin. Presumably for reference, the cartographer also identifies several more contemporary regions with updated place names, including the Canary Islands, Madeira, Spain, and Sierra Leone, to name just a few. Several rivers, mountains, and other topographical details are also noted. This map was issued as part of Delisle de Sales' Histoire des hommes. Partie de l'Histoire Ancienne. Becasue most of Sales' work was burnt under the censorship of heresy, this volume is exceedingly rare. Delisle de Sales, Histoire des Hommes. Partie de l'Histoire Ancienne (Paris) 1770. Very good. Original platemark visible. Minor wear along original folds. Blank on verso. Schoff, W., The Periplus of Hanno: A Voyage of Discovery Down the West African Coast, By a Carthaginian Admiral of the Fifth Century B.C.